1. Place the potatoes in a saucepan half filled with water and add 1 tablespoon of torn fresh mint leaves and a sprinkle of sea salt. Place the saucepan, with lid, over a high heat and bring to the boil. Cook for 20-25 minutes or until the potatoes are completely cooked through. 2. While the potatoes are cooking, place a frying pan over a medium heat and melt the butter. When the butter is melted, add finely diced shallots and cook until soft. Remove from the heat and stir in the lemon juice, lemon zest and Dijon mustard. 3. Drain the potatoes, slice them in half and add them to your serving dish followed by the fresh peas. If you’re using frozen peas, cook them in boiling, salted water for 2 or 3 minutes. 4. Next add the radishes, mint and lemon butter dressing and toss together to make sure all the ingredients are completely coated. Make sure your potatoes are still warm when you’re adding the dressing as they will absorb the dressing much better. 1. Place a frying pan over a medium heat and add the butter. Swirl the pan around so that the butter is spread throughout the whole pan. 2. Place the fish fillets in the frying pan, and season with sea salt and freshly ground black pepper. Allow to cook for four minutes, then carfeully turn over the fillets and cook for a further four minutes. After two minutes, sprinkle the lemon or lime zest and finely chopped herbs over the fish, and squeeze the lemon/lime juice long the fillets. 3. Slightly tip the pan to the side, so that the juices gather at the tipped side of the pan. Using a spoon scoop the juices from the pan and pour them back over the fish, repeat a few times. 4. When the fish is cooked arrange on two warmed plates, and pour all the juices from the pan over the fish. 5. Serve with a fresh gree leaf salad and steam new potatoes or green vegetables. 1. Pre-heat the oven to 180°C / 350°F. 2. Place all the ingredients for the fish cakes except the butter in a large bowl and season with salt and pepper. Mix well until all the ingredients are well combined. Divide the mixture into four balls, and shape each into a patty. 3. Place a frying pan over a medium heat and add the butter. Once the butter has melted, add the fish cakes and brown on both sides. Transfer the fish cakes to a baking sheet and bake for 10 minutes. 4. While the fish cakes are baking, mix all the ingredients for the horseradish cream together in a small bowl and season with salt and pepper. 5. To serve, place each fish cake on four warmed plate with a spoonful of the horseradish cream and a wedge of lemon, plus a handful of watercress, if you wish. 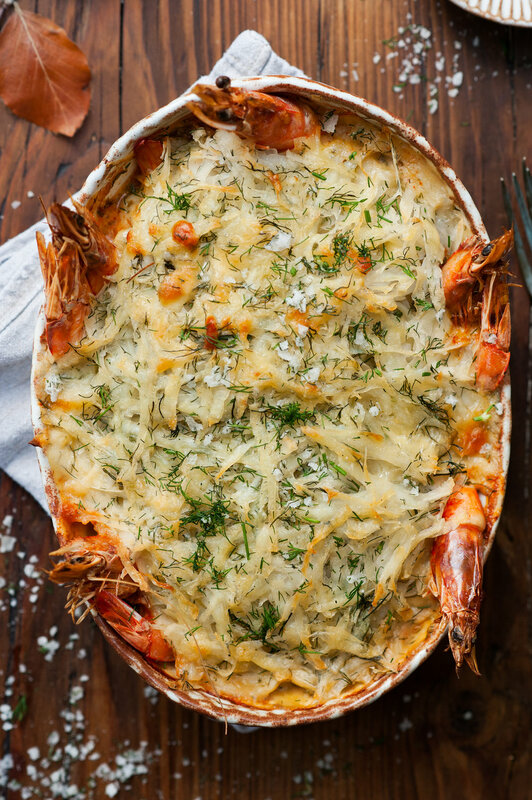 What is more comforting than a sumptuous fish pie - my secret is a cracking crispy cheddar rosti on top. 1. Preheat the oven to 200°C/400°F/gas mark 6 and grate the raw potatoes with the larger part of a box grater and pop the grated potatoes into a bowl of cold water to stop them from going brown. Grate the cheddar using the same said of the grater and set aside in a bowl. 2. Place the smoked haddock and the salmon in a saucepan, pour over the milk and drop in the onion, bay leaf and peppercorns. Cook over a low heat for five minutes, then drain, holding on to the milk but discarding the onion, bay leaf and peppercorns. Then add the fish to the roasting tray. 3. Melt 150g of butter in a saucepan then stir in the flour and cook for five minutes to make a roux. Add the milk that you poached the fish in as well as the mustard, and whisk, until the sauce is smooth and thick. Season with salt and pepper, add in half the dill and pour over the fish. 4. Drain the grated potatoes and pat dry with a clean tea towel until they are completely dry. Mix the grated potatoes in a bowel with the grated cheddar, rest of the dill and sea salt and scatter over the fish and the sauce. 5. Melt the remaining butter in a saucepan and brush over the top of the pie to ensure the top gets really crispy. Bake for 20 minutes, or until golden brown.